QRP International has a core purpose: “Developing professionals to facilitate change“. We believe in change as a tool for growth and improvement, not only professionally, but also in our society. This is the reason why every year we choose to support a cause. This year we chose to support Hope and Homes for Children. Over 8 million of children worldwide live in orphanages or other forms of institutional care. Hope and Homes for Children has a mission: to be the catalyst for the global elimination of institutional care of children and ensure that all children can grow up in lovely and safe families. Hope and Homes for Children is working in over 30 countries to dismantle orphanage-based care systems and to find safe and loving families for children who live in orphanages. They’re also working with governments to tackle the root causes of family breakdown, and to prevent family separation. Indeed, the 80% of children confined to orphanages are not orphans: they have at least one living parent or relative but are abandoned because of poverty, disability or discrimination. With the right support, these children can join loving foster families or, if they are old enough, they can be supported to live independently. The mission could seem impossible but it is not: since 1994, Hope and Homes for Children have transformed the lives of thousands of children by closing 109 orphanages across 9 countries. 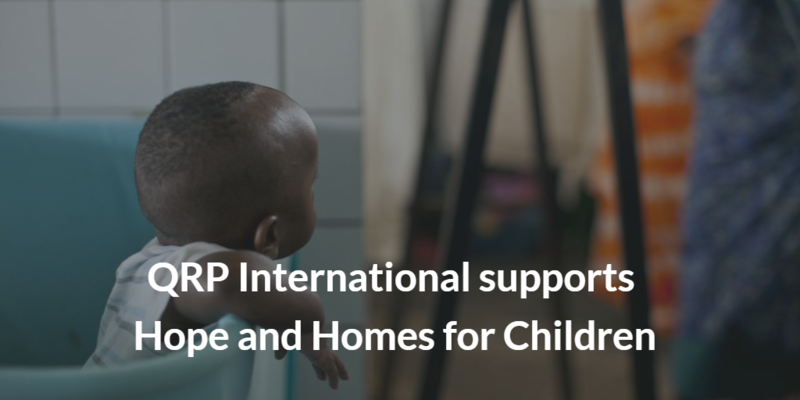 QRP International decided to support the organization with a donation that will enable 3 vulnerable children, currently held in bleak orphanages, to start a new and better life with their birth family or with a foster family. Because all children need to live in a safe and stable environment to grow and develop their potential.